This week we got to participate in something that, as a mother of two girls and no boys, I never thought we would. We went to the Blue and Gold Banquet. Scott is one of the Weblos advisors. 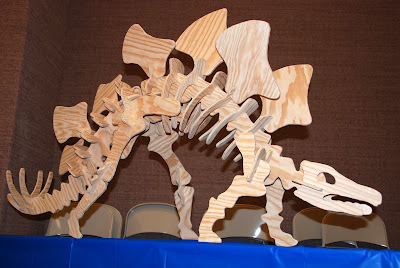 He and Justin spent several nights working on this fantastic dinosaur. Justin found a much smaller version and made a pattern from it. 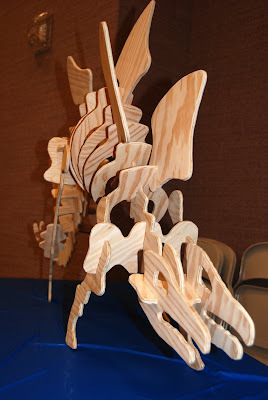 It looked amazing and everyone was very impressed with it. 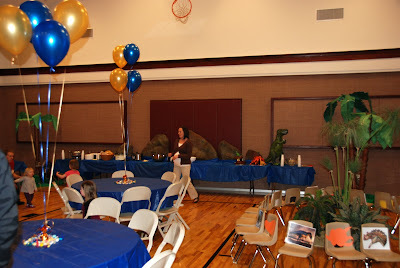 The leaders did a fantastic job on the decorations, it had a Jurassic theme. The food was yummy and the activities were well planned and executed. One of the funniest things to happen during the evening, was that Ivy won the jelly bean contest. 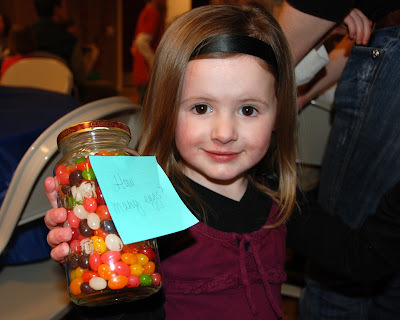 "She" guessed 313 jelly beans and there were 316. When they called her name, she worked her way up to the front to claim her price. She was so excited and proud of herself. Scott had no idea how many there were, but guessed well. (This is the second time he has guessed close in the last 2 events we have attended).